Gamma-aminobutyric acid, or GABA, is an amino acid that is not incorporated into proteins but serves as a neurotransmitter in the central nervous system of mammals. This chemical, C4H9NO2C4, is secreted by certain neurons in the brain and spinal cord and generally has an inhibitory effect in terms of the transmission of nerve impulses in adult vertebrates (but excitatory early in development). GABA is also directly responsible for the regulation of muscle tone. Unlike its function in adult vertebrates, GABA acts on excitatory receptors in insect species. GABA is integral to the functioning of the central nervous system. It is the main inhibitory neurotransmitter of the brain and most central nervous system synapses are GABAergic. GABA works in cooperation with excitatory influences (glutamate, epinephrine, norepinephrine), as a type of braking system, to allow the brain to maintain balance. Excessive excitatory influences and excessive inhibitory influences both lead to complications (anxiety, insomnia, seizures or sedation, anesthesia, and so on); together, the system can maintain balance. GABA is of pharmacological importance in the function of many anti-anxiety drugs, whether by affecting GABA receptors, release, uptake, or so forth. Gamma-aminobutyric acid is the chief inhibitory neurotransmitter in the mammalian central nervous system. It plays an important role in regulating neuronal excitability throughout the nervous system. Although some GABA can be found in pancreatic islet cells and kidney, there are no significant amounts of GABA in mammalian tissues other than the tissues of the nervous system. In spastic cerebral palsy in humans, GABA cannot be absorbed properly by the damaged nerve rootlets corresponding to affected muscles, which leads to hypertonia in those muscles. Disrupted GABAergic signaling has been implicated in numerous and varied neurological and psychiatric pathologies including movement and anxiety disorders, epilepsy, schizophrenia, and addiction. Gamma-aminobutyric acid was first artificially synthesized in 1883, and was first known only as a plant and microbe metabolic product. In 1950, however, GABA was discovered to be an integral part of the mammalian central nervous system (Roth et al. 2003). 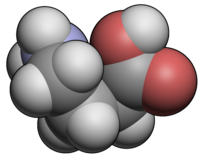 Gamma-aminobutyric acid is technically an amino acid. That is, GABA is an organic molecule with three main components: an amino group (-NH2), a carboxylic acid group (-COOH), and an R group, or side chain, unique to each amino acid. However, it is a nonstandard or "non-proteinogenic" amino acid in that it is not found in proteins, as is also the case of L-DOPA and carnitine. However, GABA rarely is referred to as an amino acid. This is because the term "amino acid," used without a qualifier, commonly refers to the alpha amino acids: those amino acids in which the amino and carboxylate groups are attached to the same carbon, the so-called α–carbon (alpha carbon). The amino acids that are proteinogenic (incorporated into proteins) are alpha amino acids. GABA is not an alpha amino acid and it is not incorporated into proteins. GABA's chemical formula is C4H9NO2. GABA is found mostly as a zwitterion, that is, with the carboxyl group deprotonated and the amino group protonated. Its conformation depends on its environment. In the gas phase, a highly folded conformation is strongly favored because of the electrostatic attraction between the two functional groups. The stabilization is about 50 kcal/mol, according to quantum chemistry calculations. In the solid state, a more extended conformation is found, with a trans conformation at the amino end and a gauche conformation at the carboxyl end. This is due to the packing interactions with the neighboring molecules. In solution, five different conformations, some folded and some extended are found as a result of solvation effects (Majumdar and Guha 1988; Sapse 2000). The conformational flexibility of GABA is important for its biological function, as it has been found to bind to different receptors with different conformations. Many GABA analogues with pharmaceutical applications have more rigid structures in order to control the binding better (Majumdar and Guha 1988; Sapse 2000). In vertebrates, GABA acts at inhibitory synapses in the brain by binding to specific transmembrane receptors in the plasma membrane of both pre- and postsynaptic neuronal processes. This binding causes the opening of ion channels to allow the flow of either negatively charged chloride ions into the cell or positively charged potassium ions out of the cell. This action results in a negative change in the transmembrane potential, usually causing hyperpolarization. Three general classes of GABA receptor are known: GABAA and GABAC ionotropic receptors, which are ion channels themselves, and GABAB metabotropic receptors, which are G protein-coupled receptors that open ion channels via intermediaries (G proteins). Neurons that produce GABA as their output are called GABAergic neurons, and have chiefly inhibitory action at receptors in the adult vertebrate. Medium Spiny Cells are a typical example of inhibitory CNS GABAergic cells. In the hippocampus and neocortex of the mammalian brain, GABA has primarily excitatory effects early in development, and is in fact the major excitatory neurotransmitter in many regions of the brain before the maturation of glutamate synapses. GABA exhibits excitatory actions in insects, mediating muscle activation at synapses between nerves and muscle cells, and also the stimulation of certain glands. Whether GABA is excitatory or inhibitory depends on the direction (into or out of the cell) and magnitude of the ionic currents controlled by the GABAA receptor. When net positive ionic current is directed into the cell, GABA is excitatory; when the net positive current is directed out of the cell, GABA is inhibitory. A developmental switch in the molecular machinery controlling the polarity of this current is responsible for the changes in the functional role of GABA between the neonatal and adult stages. That is to say, GABA's role changes from excitatory to inhibitory as the brain develops into adulthood. Drugs that act as agonists of GABA receptors (known as GABA analogues or GABAergic drugs) or increase the available amount of GABA typically have relaxing, anti-anxiety, and anti-convulsive effects. That is, some anti-anxiety drugs are believed to be effective through the mediation of GABA. Many of the substances below are known to cause anterograde amnesia and retrograde amnesia. Because GABA can act as a muscle relaxant, there is some suspicion that GABA has been used in sports competitions to reduce anxiety or assist with those competitions that require more relaxed and smooth movements, such as shooting or archery competitions. Boehm, S. L., I. Ponomarev, Y. A. Blednov, and R. A. Harris. 2006. From gene to behavior and back again: New perspectives on GABAA receptor subunit selectivity of alcohol actions. Adv. Pharmacol. 54: 171–203. PMID 17175815. Retrieved October 10, 2006. Boehm, S. L., I. Ponomarev, A. W. Jennings, P. J. Whiting, T. W. Rosahl, E. M. Garrett, Y. A. Blednov, and R. A. Harris. 2004. γ-Aminobutyric acid A receptor subunit mutant mice: New perspectives on alcohol actions. Biochemical Pharmacology 68(8): 1581-1602. Retrieved October 10, 2008. Diaz, J. 1996. How Drugs Influence Behavior. Englewood Cliffs: Prentice Hall. ISBN 0023287640. Dimitrijevic, N., S. Dzitoyeva, R. Satta, M. Imbesi, S. Yildiz, and H. Manev. 2005. Drosophila GABAB receptors are involved in behavioral effects of gamma-hydroxybutyric acid (GHB). Eur. J. Pharmacol. 519(3): 246–52. PMID 16129424. Retrieved October 10, 2008. Dzitoyeva, S., N. Dimitrijevic, and H. Manev. 2003. Gamma-aminobutyric acid B receptor 1 mediates behavior-impairing actions of alcohol in Drosophila: Adult RNA interference and pharmacological evidence. Proc. Natl. Acad. Sci. U.S.A. 100(9): 5485–90. PMID 12692303. Retrieved October 10, 2008. Granger, P., B. Biton, C. Faure, X. Vige, H. Depoortere, D. Graham, S. Z. Langer, B. Scatton, and P. Avenet. 1995. Modulation of the gamma-aminobutyric acid type A receptor by the antiepileptic drugs carbamazepine and phenytoin. Mol. Pharmacol. 47(6): 1189–96. PMID 7603459. Retrieved October 10, 2008. Hunter, A. 2006. Kava (Piper methysticum) back in circulation. Australian Centre for Complementary Medicine 25(7): 529. Majumdar, D., and S. Guha. 1988. Conformation, electrostatic potential and pharmacophoric pattern of GABA (gamma-aminobutyric acid) and several GABA inhibitors. Journal of Molecular Structure: THEOCHEM 180: 125-140. Retrieved October 10, 2008. Mihic, S. J., Q. Ye, M. J. Wick, V. V. Koltchine, M. D. Krasowski, S. E. Finn, M. P. Mascia, C. F. Valenzuela, K. K. Hanson, E. P. Greenblatt, R. A. Harris, and N. L. Harrison. 1997. Sites of alcohol and volatile anaesthetic action on GABAA and glycine receptors. Nature 389(6649): 385–9. PMID 9311780. Retrieved October 10, 2008. Roth, R. J., J. R. Cooper, and F. E. Bloom. 2003. The Biochemical Basis of Neuropharmacology. Oxford: Oxford University Press. ISBN 0195140087. Sapse, A.-M. 2000. Molecular Orbital Calculations for Amino Acids and Peptides. Birkhäuser, ISBN 0817638938. This page was last modified on 19 May 2017, at 16:24.